Maine Independent Angus King To Caucus With Senate Democrats : It's All Politics Sen.-elect Angus King of Maine, who cruised to victory last week running as an independent, said Wednesday that he will caucus with Senate Democrats, giving them in effect a 55-45 seat advantage next year. 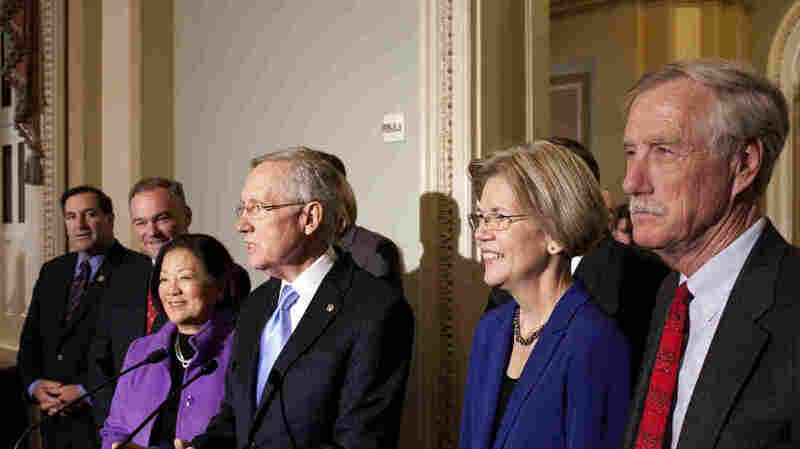 Sen.-elect Angus King of Maine (far right) joins newly elected Democratic senators and Senate Majority Leader Harry Reid on Capitol Hill on Wednesday. From left: Joe Donnelly of Indiana, Tim Kaine of Virginia, Mazie Hirono of Hawaii, Reid, and Elizabeth Warren of Massachusetts. Sen.-elect Angus King of Maine, who cruised to victory last week running as an independent, said Wednesday that he will caucus with Senate Democrats. King's announcement means the Democrats will have in essence a 55-45 seat advantage in the Senate next year. The Senate's other independent, Bernie Sanders of Vermont, also caucuses with the Democrats. King was elected last week to replace the retiring moderate Republican Sen. Olympia Snowe. "I have decided to affiliate with the Democratic Caucus because doing so will allow me to take independent positions on issues as they arise and at the same time be an effective representative of the people of Maine," King said in a lengthy statement. "One final word. By associating myself with one side, I am not in automatic opposition to the other. In the situation of a Republican House, a Democratic Senate but with substantial powers in the minority, and a Democratic president, no one party can control the outcome of our collective deliberations. As Bill Clinton might say, it's just arithmetic. In fact, this situation has only two possible outcomes — action based upon good-faith compromise or no action resulting from political deadlock. "And this latter is simply unacceptable to the American people." The former governor of Maine, a former Democrat, had refused throughout the campaign to reveal whether he would caucus with Democrats or Republicans if elected. But his announcement Wednesday came as little surprise. In an interview with NPR's Robert Siegel after his election, King said he was optimistic the new Congress would be able to find areas of agreement during a second Obama term. "I worked in the Senate as a young staffer in the '70s and saw it actually work," he said. "I saw senators of both parties sit around the table, argue, disagree, agree, but finally reached consensus and passed important legislation. So it can happen."